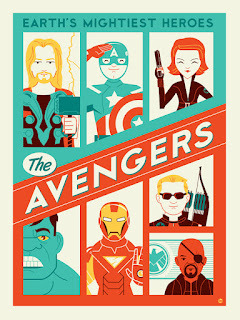 OK, so I just got back from seeing the Avengers movie and I absolutely loved it. Ever since the first Iron Man movie I have been itching to see this. So much fun to watch, it really was like a comic book came to life. Anyway, I also had the pleasure of getting to do a poster for the movie through Marvel and Gallery 1988 which was a dream to work on. Great looking poster art man!